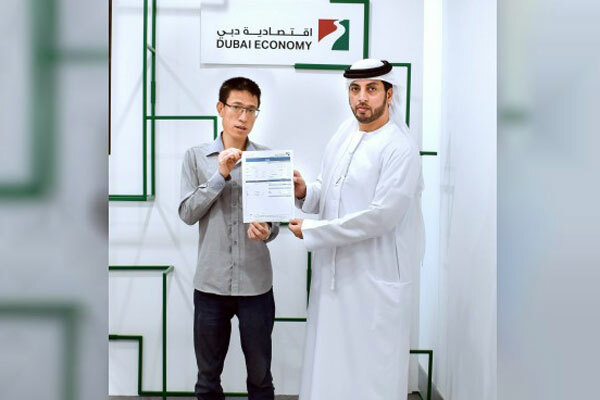 DED official presenting the first licence in Chinese. Dubai's Department of Economic Development (DED) said it had issued a total of 13,825 new licences during the first nine months of the year. The Business Registration and Licensing (BRL) sector of DED said among the new licences issued, 61.2 per cent were commercial, 36.4 per cent professional, 1.2 per cent related to tourism and 1.1 per cent were industrial. The ‘Business Map’ digital platform of Dubai DED saw 204,319 business registration and licensing transactions being completed in the first nine months of 2018. This reflects the ease of doing business in Dubai and the economic dynamism of the emirate, as well as the city’s attractiveness for companies across sectors seeking growth opportunities, said DED in its statement. The report showed that the top nationalities that secured licences in the first nine months of 2018 were India and Pakistan, followed by Britain, Egypt and France. In the first nine months, BRL issued 840 instant licenses that took less than five minutes to be issued. These Instant Licences are issued in a single step without the need for an MOA. The Business Map showed that Licence Renewal and Modification accounted for 23,963 transactions during the period,, while 24,208 were related to Licence Modification, 80,168 for Licence Renewal and 1,350 for Certificates. The number of Trade Name Reservations reached 26,040, while the number of Initial Approvals totalled 17,864, said the statement. The 27 outsourced service centres of DED continued to witness robust activity in the first nine months of 2018 accounting for 149,603 transactions; Tassheel – Al Twar accounted for 49,649 transactions followed by Tassheel – Al Barsha (12,756), Twasol Businessmen Services - Al Muraqabat (12,089), Emirates Professional Business Centre (11,688), and Itqan Businessmen Services (10,157). The Auto Renewal service of DED, which takes less than two minutes via a text message, recorded 34,410 transactions in the first nine months of 2018, 43 per cent of total renewed licenses (80,168), stated DED. The report highlighted the distribution of the new licences in the first nine months of 2018 according to the main areas in Dubai, with Bur Dubai garnering the lion's share (7,628), followed by Deira (6,156), and Hatta (41). The top sub-regions were Burj Khalifa (1,721), Bur Dubai (1,102), Al Marar (878), Port Saeed (676), Naif (633), Dubai World Trade Centre 1 (544), Al Garhoud (489), Hor Al Anz (412), and Al Karama (341), it stated.